Have you ever needed to order or specify display cases for your museum and not know how to describe what you want? Let’s take a look at what makes a display case “museum grade” and how to avoid getting less and paying more. This website will focus on differences between acrylic and glass, basic cases styles and types of glass, hinges and gaskets. 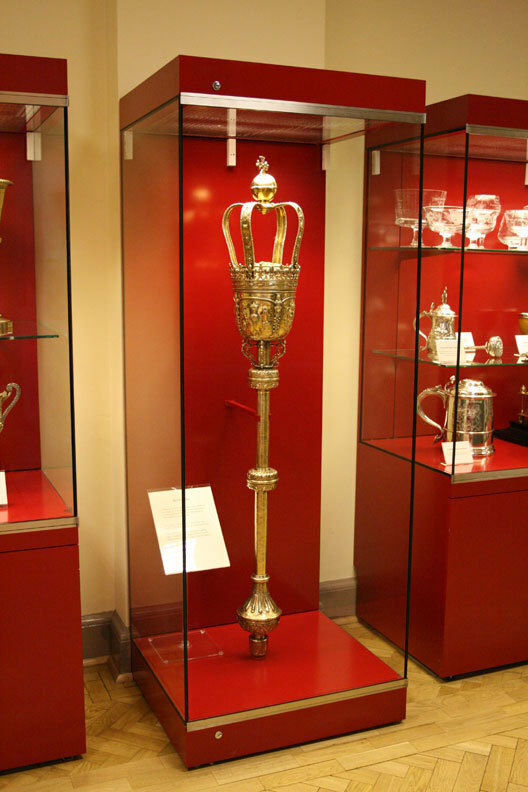 We will use a “Good, Better, Best and Unacceptable” approach to specifying for your museum. The major departments of the government that use cases are the National Park Service (NPS), The Smithsonian, and the National Archives and Records Administration (NARA). In order to create this discussion I looked at these major government agencies that use cases and their specifications. Unfortunately I have yet to find a definitive set of standards from these three organizations. There is a lot of fragmented and anecdotal information, and specifications that are as little as 5 years old still contain erroneous data on certain materials that are now considered unacceptable for case building. Case specifications can be one of the more difficult parts of creating a new gallery or renovation. Very often the display cases will be the center piece of the show since they will house your collection. They will also be a major part of your budget. WHAT MAKES A CASE “MUSEUM” QUALITY? Museum cases are just the same as retail store showcases, but more expensive, right? Wrong! There are many reasons why you should not purchases retail type fixtures to use in a museum setting. SECURITY- Higher security is an issue with museums. Although jewelry stores may have higher value, they can control access to locks by keeping locks in employee only areas. Museums very often have to keep locks accessible to the general public because display cases are in the round or the access doors are part of the viewing area. ENVIROMENT- Air circulation and environment control are major issues with museums. Needing cases with a low air exchange rate can exacerbate the need for conservatorially sound materials inside a case. Gaskets and proper building techniques are used in museum casework to keep air exchange rate down to 10% per day or less. At the very least, cases should be designed with dust seals to reduce housekeeping issues. DESIGN- Clarity through design is key to showing off your collection. Common retail casework use frames to hold glass. 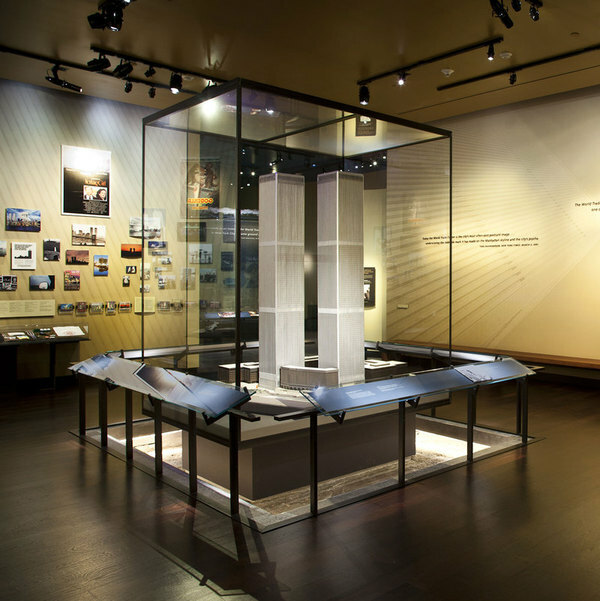 Museum casework is best known for being ‘frameless’ in design and construction. SIZE- Museum cases can be HUGE! Most fabricators that work in the retail environment do not know how to design and build cases that are large or complex. The first major issue is to decide if you want to specify Acrylic or Glass? Once you have defined your glazing type you can begin to define case types that you need. However, sometimes case types might define whether you use glass or acrylic. Depending on case size and style you may need to move toward glass as your solution. After you move through this step, you can create a set of specifications for individual cases. Lower cost- Material cost is lower and fabrication is usually less money because acrylic is easier to work with. Faster lead time- More shops work with acrylic in America so it can usually be produced faster. Easier to replace in an emergency. Easier bonding techniques make for better 5 sided bonnets. Shorter lifespan- Scratches easily, more prone to vandalism, clouds with constant cleaning and fabrication techniques lead to crazing and surface defects. This can quickly offset the lower cost mentioned earlier. As a general rule of thumb, if you plan to keep a case for more than 2 years, consider glass. Can off gas harmful pollutants- Newer fabrication techniques such as extruded and melt cast (a fancy name for extruded) add plasticizers that off gas and harm your exhibits. Standard extruded acrylic will often fail an Oddy test. In many instances there is no way to tell if acrylic is cast or extruded. Because of this NARA (the National Archive and Records Administration, which is in charge of protecting documents like the declaration of Independence and Presidential libraries) has removed acrylic from its acceptable materials list. Limited opening techniques- Acrylic and hinges don’t play well together. Since Acrylic is not structural (sags easily) it needs to be bonded into a structure that lifts off or hinged doors need to be in frames. Size limits- Acrylic does not work well for larger cases. If you have a mix of smaller and larger casework, consider glass for a more uniform look. Use Acrylic for short term exhibits only (Two years or less). Do not consider Acrylic as a CAPITAL investment. Long life- A good quality museum glass case can have a lifespan of 25 years or longer. I recently saw a collection of cases in Cologne Germany that were over 30 years old, and I thought they were new. Structural- Because glass has a higher tensile and shear strength over acrylic, it can be more self-supporting. This allows for frameless door designs and less bow and flex when gaskets put pressure against glass panes. Larger sizes- Glass is just bigger. If you are looking for taller, wider or bigger, glass is the way to go. Better security- Modern laminated safety glass not only blocks UV light but is much stronger than standard acrylic. If it does get broken through brute force it still remains in a single pane because of the inner foils and keeps the display case structurally sound. Better hinge choices- Because of the strength of glass and modern bonding techniques, glass is better for large hinged doors. Higher cost- I wonder if this is a disadvantage? Generally speaking, high cost means higher quality, and that is the case with glass. Higher weight- On average twice that of acrylic, but thinner glass can be used where thicker acrylic is needed for structural reasons, so sometimes this can equal itself out. 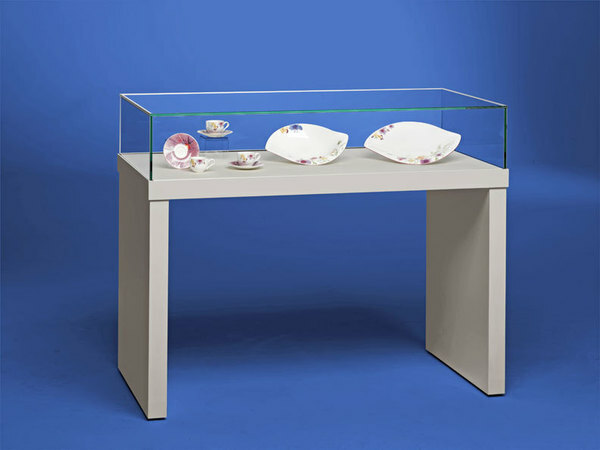 Longer lead time- When ordering museum cases made with glass, plan on a longer lead time. Plan on 120-210 days from contract to delivery. 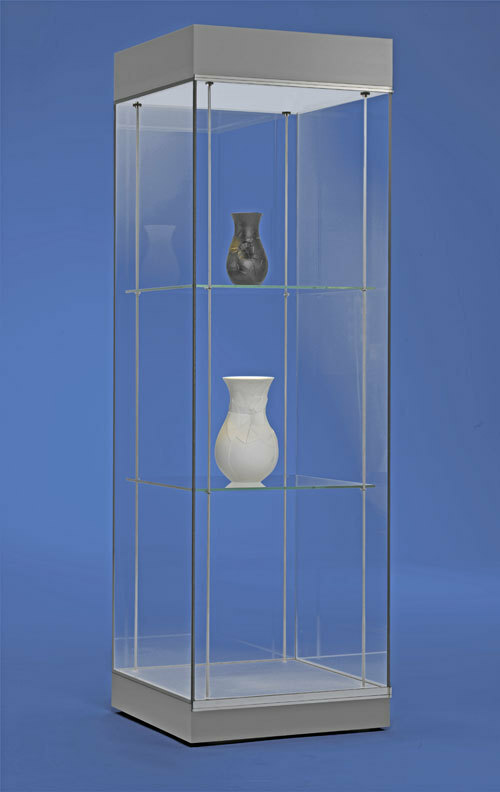 Some Quick ship glass cases systems are available in as little as 3 months if you need standard case sizes and styles. Use Glass for longer term exhibits (Two years or more). Consider case sizes and how it relates to your collection- You will get long life from your investment and ultimately lower your operating budget. Specify ONLY cast acrylic- Cast acrylic has less plasticizer and will off gas less. Interestingly, NARA has EXCLUDED all acrylic from their high end display cases because of new off gassing issues. Always specify UV inhibiting acrylic- Even if you are displaying rocks, you never know if your exhibit department will repurpose the cases for butterflies next month. Play it smart and always specify UV inhibiting acrylic. It is better to specify UF3 by Plexiglas or OP2 by Acrylite. There are many no name imports that do not have any verified UV protection. Also, by specifying these two particular brands, you will be assured that the acrylic is cast. OP3 by Acrylite is extruded and should be avoided. Avoid anti-reflective acrylic- Although this is desirable option in glass, it should be avoided in acrylic. The typical technique to reduce glare in acrylic is to give it a slightly frosted finish. This obscures objects at any distance. It is OK when used in framing. Some acrylic is coated with an anti-reflective coating similar to glass (see below), but this creates big problems when bonding acrylic into cases and should be avoided. Avoid abrasion resistant coated acrylic- Acrylic can be made abrasion resistant by coating it with a thin layer of quartz (glass). This is a great product when used as flat sheets. However it is nearly impossible to build cases from this product. Also, the cost of this material is similar to glass, so why not get glass? Consider which bonding method- There are two different bonding methods (actually three) and they have different quality levels and radically different pricing. Solvent bonded- This uses a solvent that ‘welds’ the acrylic together and then evaporates. These bonds are superior in strength (chemical bond), but inferior in clarity. A solvent bond can have small bubbles present but a professional shop can minimize those bubbles greatly. PS-30 or UV bonded- These bonds are also known as “bubble free” or “museum quality”. These use glue that is put into the seam and then cured. Seams are mostly bubble free but not as strong (physical bond). Seams can discolor and crack after a few years and the new UV bonding method has not been Oddy tested (as far as I know). Standard thicknesses include 8.76mm, 10.76mm and 12.76mm. As part of your specifications, thickness should be determined by the engineer based on overall height of the glass. Low iron- Also known as “water white” or “super clear”. Try to use the term low iron as this is the correct technical term. Specifying a particular brand such as Starphire by PPG will increase the cost of your cases by restricting choice. This glass typically adds less than 5% to the total cost of a case project and is worth the extra cost. Anti-reflective coatings- Glass can be coated at the point of manufacture with an antireflective coating that reduces glare by up to 98%. It is a beautiful product with an added cost of 20% to 50% on a case project. Consider using this judiciously in a project on your centerpiece cases or high light areas such as lobbies or atriums. If you are interested in this option, consider asking for AR coating as an optional price. NEVER specify tempered glass in a display case! Although tempered glass can be considered ‘safety’ glass it accomplishes this through breaking into a 1000 small pieces. Imagine if the side of your display case broke into a 1000 pieces? Additionally, tempered glass does not have any UV inhibiting characteristics which are essential to conservatorial care of your collection. In addition to what you look through, we also need to consider the structure that holds everything together. This is where most of our problems take place and small differences in specifications can make big changes in final price. Wood based materials are generally used in case construction because it is readily available and economical to build with. Most museums have or have access to a woodworking shop. It is also the material most likely to pollute the environment inside your case. The trick is to use the best materials possible and seal or cover them with materials that minimize the transfer of pollutants into the case. Let’s look at some of the most popular materials. Standard particle board, cabinet grade plywood, luan plywood and MDF- These types of materials are considered UNACCEPTABLE for museum case construction because they use urea formaldehyde glue in their production and off gas large amounts of formaldehyde and acids into the air. MEDEX, Medite II and other ZF (zero formaldehyde) MDF products- These are the most often specified case materials for museum work. The common belief for years is these MDF (medium density fiberboard) materials were the lowest formaldehyde products available because they did not use urea formaldehyde glues in their production. As of this point NPS still specifies these products but the Smithsonian no longer considers them acceptable (NARA does not consider ANY wood products acceptable). Consider at the least a liquid applied type membrane barrier such as waterborne polyurethanes or two-part epoxy and at best a physical barrier such as metal laminate foils (marvel seal), HPL laminates (Formica) or actual metal such as sheet aluminum. Water based acrylic latex coating including paint offer no protections. However these types of paint can be applied over the waterborne polyurethane coatings for aesthetic purposes. Appleply- Appleply by States Industries is now the wood based material that the Smithsonian recommends. There are similar products available in Europe because this type of multilayer birch veneer plywood with a non-urea based adhesive is widely used in Europe for toy manufacture. This material STILL off gasses formaldehyde, but at a lower rate than the ZF MDF products. This product still needs a liquid membrane or physical barrier applied to the surface. Solid woods- Solid woods should be avoided under almost all conditions due to their expansion and contraction issues however; woods that have a low resin and acid content are the best choices for construction techniques if you need to use them. Consider birch or poplar and avoid high resinous or acid woods like oak and walnut. Use the same sealing techniques as above. Because of the above mentioned problems with wood, certain institutions such as NARA no longer consider any wood products acceptable for case construction. Metal carcass and case construction is now used for many high end institutions but it increases the cost of case construction. Materials such as welded frames, powder coated steel and aluminum and stainless steel are the most popular materials used in these case types. Always make sure you specify powder coated metal finishes because they do not have any VOC (volatile organic compounds) in the powder coat film. Paints- It is difficult to separate a paint surface between inside and outside. Standard commercial finishing practices are set up for more of an “overall” finishing technique. Additionally, with wood products, if you do not “balance” your finish (put the same finish on both sides), then warping can occur with wood based products. This is not a problem with metals. Avoid specifying proprietary or “household” color systems such as Benjamin Moore or Sherwin Williams. Certain regions of the country may not have that brand of paint. We have also found paint colors from Home Depot may not be available from state to state. It is always preferable to specify a nonproprietary color system such as RAL (ralcolor.com) or NCS (ncscolour.com). RAL is more common. NEVER specify Pantone for paint!! Pantone is a printing color system and does not translate into paint. Powder Coating- Powder coating is a system that applies powdered coatings and then bakes (melts) them onto the surface. Absolutely no VOCs are used in powder coat. Perhaps the best museum finish, this can only be applied to metals and can be used inside and outside a display case. NEVER specify household paint colors (i.e., Benjamin Moore or Sherwin Williams) when specifying powder coat. Use generic color choices such as RAL. Water Based Finishes- Common water based systems are your typical household paints. These are typically used on the inside and outside of more temporary acrylic case work and on the inside of glass casework when a painted finish is preferred. One key advantage is the ability to change color easily by overpainting. VOC levels should not exceed 150g/l or 1.25lbs/Gal for non-flat paints and 50g/l or .42lbs/gal for flat paints. Allow 3 weeks off gassing prior to installation of artifacts. Although you can specify this as a part of the contract RFP, it is PREFERABLE that you do this in-house to acclimate the cases to your environment. Lacquers- Lacquers are considered furniture grade finishes and they are very durable, resilient to abrasions and easy to clean when used on the outside of a display case. Since it is long lasting, it is preferable to water based finishes on glass cases. Once fully cured and off gassed it is also acceptable for interior case work just avoid large surfaces. Consider at least 4 weeks off gassing. When using lacquers on case exteriors, consider fabric panels for the case interior sections. Solid Surfaces- Solid surface materials can be applied over wood constructions to minimize off gassing of formaldehyde as well as create a decorative surface. Most of these are inert, but consider certain issues when selecting these materials. HPL- High pressure laminates such as Formica or Wilsonart offer affordable surface solutions that are very durable. However they are difficult to change colors or repair when damage occurs. I am still unsure how the common VOC based adhesives used to apply HPL are considered acceptable, but I assume the HPL itself acts as a barrier. I would personally avoid them for case interiors if you have any plans for drilling decks or case backs for mounts to be installed in these cases. Metals- in theory metals are inert, however, decorative patinas and top coatings could be very dangerous, so be careful in their selection for case interiors. Anodized aluminum is the easiest to work with and available in many finishes. Graphics and Graphic substrates- If you are including graphics inside your cases be careful what substrate you use. Consider Oddy tests on graphic materials because of the fast paced changes in printing and make sure you stick with approved substrates such as cast acrylic (not extruded), polycarbonate, Sintra, and aluminum laminate panels such as Alucobond. Fabrics- Consider Oddy testing all long term fabrics used in casework or use materials which have been Oddy tested by the manufacturer. Two products available worldwide are Creation Baumann Ultra IV and Toray Ultrasuede. Although local distributors of similar products (i.e. Benchmark and Test Fabrics) are OK, they can discontinue fabrics or they may not be available internationally. So what makes a museum display cases different in their design from storefront case design? There are some basic designs and construction differences that we need to consider. Environmental- Does your case hold an environment that is different from the rest of the museum or at least buffer the variations that occur on a daily basis? Even if your museum has state of the art climate control, daily heat and cool cycles, major climatic shifts such as weather fronts, and influx of visitors can change your environment quickly. One way to alleviate the problem is to add gaskets and silica compartments to your cases. Dust seals- At the very least museum casework needs dust seals. These are brush seals that reduce dust exchange with ambient air. Very few museums consider this acceptable anymore, but it is considered a bare minimum. Compression gaskets- These are usually bulb style or foam style gaskets that compress to create a seal. On certain glass/acrylic to hard surfaces (generally at a right angle), this is an acceptable seal. When this type of seal is used glass to glass or acrylic to acrylic, they usually cause bowing and gaps can form. Usually any type of silicone seal between acrylic and acrylic is unacceptable because of bowing unless you use very thick acrylic. This type of gasket allows air exchanges around 25% per day. Adhesive gaskets- This type of silicone seal is created by a cast in place silicone. Once the silicone has been cast and cured it is cut with a scalpel for a perfectly mated seal. No bowing takes place with this type of seal. This is a preferred high quality seal for glass to glass construction and mimics other sections of the glass to glass constructions where cast in place silicone is used to join and build cases. Because an adhesive seal mimics other areas of the case construction, it also hides the door opening and makes a case more secure. This type of gasket allows air exchanges around 10% per day. Climitization- A case that can hold an environment should also be able to control the environment. The use of various techniques can keep a museum case at a certain humidity level even when the surrounding museum environment varies slightly from day to day. All of these systems should be specified to have a separate access point to the display area. You should be able to open the mechanical areas of a case without opening the display area. This helps to keep an already buffered area stable and is better for security. Passive buffer- A silica tray compartment that houses conditioned silica is the most widely used system. Make sure you get your silica preconditioned to the RH level you want. Make sure access is from a separate door. Access by lifting the base plate of your case should be avoided and may be considered unacceptable. Semi Passive- One manufacturer, NoUVIR lighting (nouvir.com) has a pretty interesting semi passive humidity control system. It uses a bladder to “pump” air in and out of the display area though standard variations in barometric pressure. This system will ONLY work with a well gasketted case. This system has the added benefit of moving the case air through scavengers which remove pollutants from the air. Active- Systems such as Miniclima (miniclima.com) uses air pumps to add or reduce the humidity in a display case. These are highly effective but at a premium price. Consider using this type of system for your most valuable and delicate objects. These systems can also be custom designed to heat and cool, move the air through scavengers or add inert gases such as argon to the case environment. Heating and cooling a case environment is problematic and should be avoided at all costs. Lighting your collection is a tricky proposition. On one hand you want your collection well lit for visitors to see, but the act of lighting adds a great deal of issues such as Ultraviolet and Infrared degradation as well as heat that can harm your collection. How to light a collection is a discussion all to its own, but here are some overall principles to consider. Overhead lighting- Most museum facilities have overhead lighting from track systems. These systems are perfectly capable of lighting your entire collection of cases. There are many benefits to not having lighting close to or inside your cases. Reduces the initial cost of purchasing cases- Let’s face it, good lighting systems are expensive and the additional casework needed to house them adds to the overall cost of the cases. If you have good lighting, consider getting cases without lighting preinstalled. Glass top cases are much lighter looking than cases with light hoods. Unfortunately many museum case manufacturers need the light hood to “hide” their hidden hinge systems. 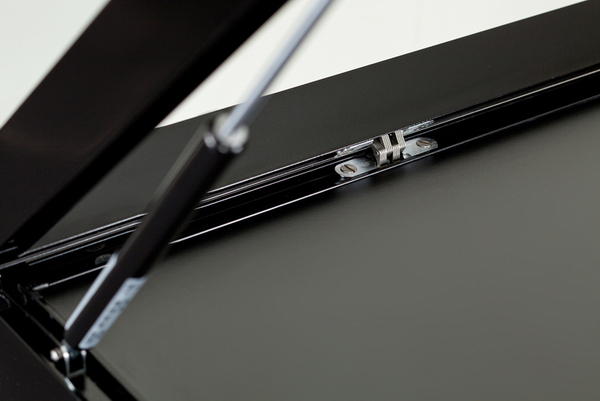 Make sure that you require all hinges to still be hidden with a glass top case. Reduces the total cost of ownership (TCO) - This might not be important to you, but your CFO will love you for this! You may even get a few more cases out of the deal. It works like this: Why own, maintain and power up two separate lighting systems when one will do? If you already own your overhead track lighting, use it and pocket the savings. Nonexistent heat buildup- I will assume you already have UV filters on your lights, but if you specify laminated safety glass or UV filter acrylic, you got this covered already. However, heat buildup from lighting is real, and removing the problem by removing the lights solves the problem. Light from a light attic- The next best choice is having a light attic. This is a light hood 6” to 8” high that houses the light system. Lighting system can be fluorescent or LED. If you choose to use Halogen or other high heat light sources, the lighting hood will need an active fan system. Avoid high heat lights and stick with LED and fluorescent. Additionally a lighthood needs to be separated from the display area by a glass or acrylic barrier. This barrier needs to have UV protection and at the LEAST can be frosted (which reduces light levels) or at best have a sealed thermo pane unit with built in UV protection and a lighting grill to obscure the view of the lighting equipment without reducing the level of light being transferred into the display area. All lighting systems should be capable of being dimmed. Lights inside a case- OK, let’s dispel one myth quickly. LED lights produce HEAT! A watt is a watt and a watt of light produces 3.2btu per hour no matter what the light source is. Even though there are fewer watts in LED lighting it is still a hazard and should be avoided in a case with environmental gaskets. They are still specified, and I don’t suggest them. Here are some general ideas and concepts on how you CAN use lights inside a case. Fiber optic lighting- Fiber optic light heads, light bars and wall washers can be safely installed in the display area of the case because they do not produce heat. The light generator is placed remotely or in a light hood above the case. AVOID putting the light generator below the display area (heat rises). You could use LED light bars in lookdown type cases sometimes because the large upper surface to display volume ratio dissipates the heat fairly quickly but that is the farthest I would go. If you MUST use LED lights in cases, make sure the drivers are outside the display area. This will lower the heat a little. Light Quality- One more thought on lighting. Although lighting is important, the quality of the light is more important. This is also a topic for an entire talk, but in short, if you specify LED lighting in any of your cases, you should specify a CRI (color rendition index) of at least 90. This number represents the quality of the light. The COLOR is also important. You should specify lighting in the 3000 to 3500 Kelvin range for museum lighting. Shelving systems in museum cases need to have certain unique characteristics from commercial display cases. There are two major styles of shelving used. Always specify rod based hanging systems. These systems are more stable and give you a better level of security. Rods should be a minimum of ¼” or 8mm and stainless steel should always be used for the additional strength and non-corrosive nature of the material. Avoid any shelving system that uses holes drilled into the glass shelves because this weakens the glass. Toolless adjustment is far better than using a tool to adjust the shelf supports. Security- Security is as important as environment or lighting. As with all factors, you need to consider ease of opening and value when you specify your security systems. Security screws- The simplest way to secure an acrylic case is to put a security type screw through the acrylic and into the wood case. The standard is called “snake eye” screws, but now that these are readily available at big box stores, consider upgrading to the newer pin style screw heads. Tumbler style locks- Specify a minimum of 5 pin locks. Locks should be designed so that when the lock is unlocked the key cannot be removed. This is a common fail safe to make sure cases are not left unlocked. Also specify if you want the locks keyed alike across the entire order or keyed separately. Additional electronic security- For all high value objects at the Smithsonian, they specify wired security contacts and shock sensors that are hard wired to a central system. Now that we have taken an in depth look at the nuts and bolts or cases, let’s take a look at designs so that you can get the cases you need for your collection. Although there are many variations within these styles, it really boils down to 5 case types. Freestanding- The freestanding case is the most versatile case type and therefore one of the most frequently used cases. These cases are almost 100% glass case types. Cases are typically 75” high minimum with full height doors. Base construction is typically minimal at 4” to 6”. These cases are either glass top, or lighthood top. Shelving systems give added flexibility and can be removed for larger objects. Internal pedestals can be used to create cases for one special object. 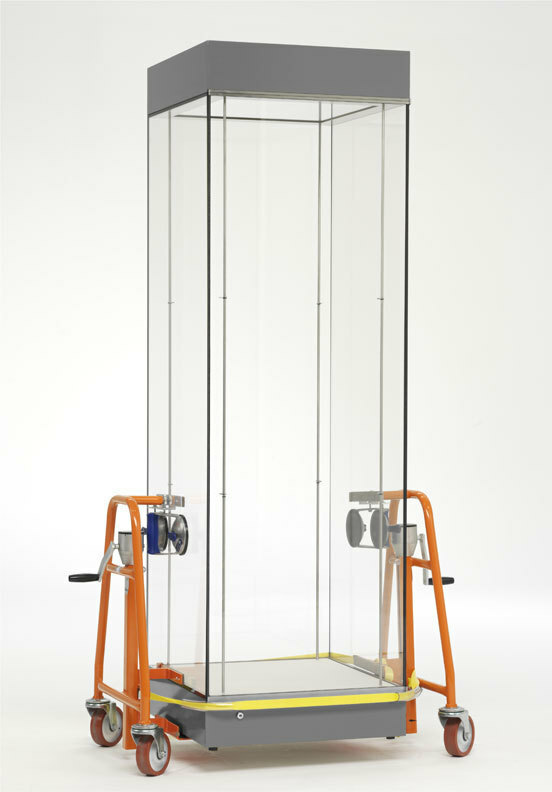 Wallstanding- Wallstanding cases are also glass and exactly the same as freestanding cases with two main exceptions. First, wallstanding cases have some sort of back panel. However, consider additional flexibility by making a freestanding case with a removable back panel. Second, some wall cases are too shallow to stand on their own. When the case door is opened they can tip forward so they need to be attached to the wall. Avoid shallow cases unless you have severe size constraints because shallow cases can restrict object choice. In Wall- In wall cases typically are just doors or removable panels set onto or into your wall with a varying degree of depth behind. The glazing can be either acrylic or glass, but considering the investment of an in wall case, consider glass. Hinged doors are preferable to removable panels for speed of entry in an emergency. Doors should be gasketted like all other museum cases. Internal lighting is necessary. 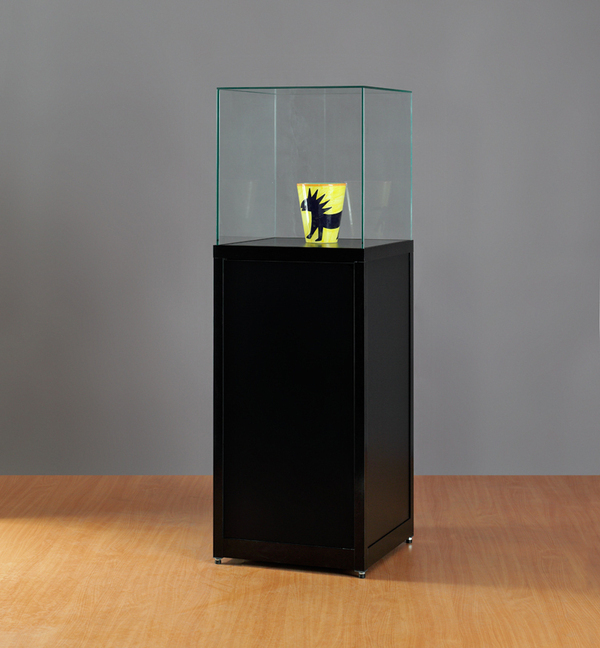 Lift off pedestal style- Pedestal style cases can be either acrylic or glass. Typical style includes a taller base construction of 30” to 36” high (no taller due to ADA2010) and a lift off 5 sided “hood”. Typically this is the case style used for acrylic cases because acrylic does not play well with hinges. Museums try to push the envelope with this case style and I have often seen cases over 60” tall and 72” to 96” long in acrylic. These are cumbersome and dangerous to lift off. 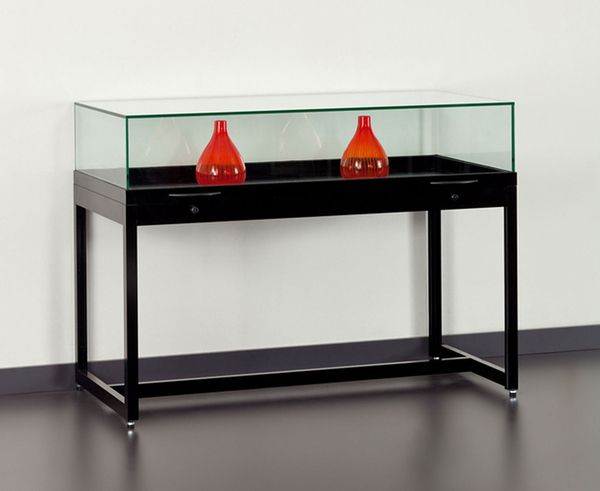 Optionally, consider a pedestal inside a freestanding glass case. 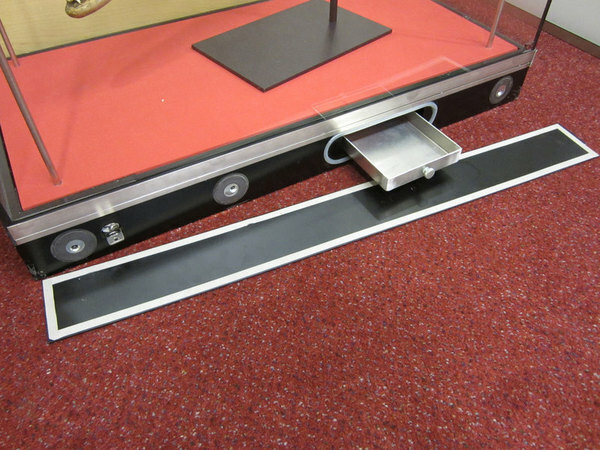 Another option is additional lifting devices built into the case system such as hydraulic lift. Lookdown- lookdown cases are also known as book or document cases and are used for small objects, textiles and documents when you want to “look down” on them. Typically the base construction is low at 27” to 30” high with a 6” to 12” high glass or acrylic 5 sided “hood” on top. Acrylic hoods are lift off and glass hoods are either hinged or hydraulic lift. Acrylic can quickly become scratched because people lean on them. 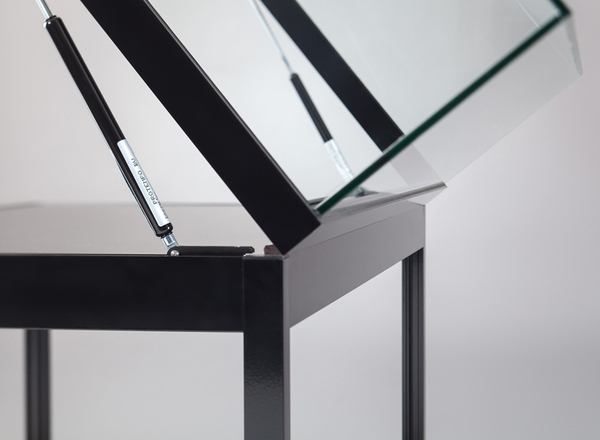 Another option for documents are freestanding cases with glass shelves and easel type mounts to support your documents. Contract cases separately from an overall bid package- If you are going through a major renovation, the museum cases will often be produced by a specialty museum case manufacturer. By removing them from the general project scope, you can save as much as 20%. No cookie cutter approach, specifications take time- Sorry, but this takes work, however consider hiring a consultant to help you create your specifications. The cost will more than outweigh the savings. Always buy the best you can afford- Always “buy up”. Buying high quality glass cases that last 20 years or more will be far cheaper than building acrylic cases every year or two. Also consider moving cases into the “capital” portion of a renovation. This can help with financing and amortization.